These days, in a rather short amount of time, David Tutera has become an entertaining legend. He has a hit show on WE called My Fair Wedding... and he is many a celebrity’s go-to guy for high caliber event planning. Plus, he’s the dream wedding planner for every bride. Join me as I catch up with David on a break from his grueling Manhattan-based business schedule where he reveals not only the secrets to his success, but also the secrets of his star-studded gatherings. Lance Avery Morgan: David, what makes event planning such a special endeavor to you? David Tutera: It’s the people. You know, I did a party Saturday night for about 500 people in New York and it was a really, really high-end magnificent, gorgeous event. It was for a corporation that was celebrating its 25 years of business; a contracting company actually, so the audience was somewhat interesting.We hired Tony Bennett to perform, whom I’ve worked with him many times on many events. I just love him. LAM: What’s not to love? He’s still got his chops. DT: By the way, he sounded amazing. But his people, the people who surround the big headline performers, I think are so difficult because they’re so worried about their job that they were placing so many difficult scenarios for us logistically set up production that it became somewhat impossible. LAM: Wow, what was your venue for that? DT: One of my favorite venues in New York, if not one of my favorite venues in the country is Cipriani’s, and they’ve got so many properties in New York now. So it was the one on Wall Street, 55 Wall. By the way, great shirt you are wearing. DT: Yes, I thought so… I was about to say Robert Graham. I’m glad I didn’t wear my Robert Graham I had it in my suitcase. LAM: I’ll bet it would have been fine. You’re people told me you were staying at The Driskill Hotel here. It’s haunted so be careful. Do you like ghosts? DT: My partner Ryan, who is from Texas, and I have a wonderful home in New York City, and I have a great country home in Connecticut. We’re on ten acres and it’s haunted. We were told that by the owners when we were at the closing, ‘Well you know you have two ghosts. I was like, ‘what?’ One of them is very active and we have the same housekeeper that’s been there for like 16 years prior to us and she’s very well aware of it. LAM: Wow, have you done things to sort of ward off this ghost? DT: You know what, I think the ghost is friendly. People think I’m insane for talking about it, but I welcome the ghost so it welcomes me into…he was there before I was. So you know what, that’s fine. LAM: When you are not with your ghosts, what are you up to these days? LAM: So it sounds like you’re challenged to do that, even with your vast talents. DT: Thank you, it’s everything from giving her proper etiquette for at least the day and transforming her physically through fashion and through beauty. Then, also, we’re revamping or changing the planning that she has put into her wedding to make it a much better wedding. I’m excited about it. You know what, it feels like really good TV. LAM: Well, we’ll definitely make sure people tune in for that. And you worked on The View, you done lots of other television. DT: Yeah, umm. I continue to do all the big TV shows, The Today show, The View, TBS Movie and a Makeover, umm, you know all the segment stuff. I do iVillage on NBC. And what’s been going on? I’m signing a new deal to begin writing books with Disney. I’m doing my first wedding book with Disney. DT: I have my own line of weddings. We’re doing our first David Tutera Couture Wedding at Disney and in 21 years of Disney being in the wedding business, it’s the largest wedding in the history of Disney. So, my first couture wedding is also the largest wedding at Disney. LAM: You take the hassle and the homework out of doing a wedding correctly. 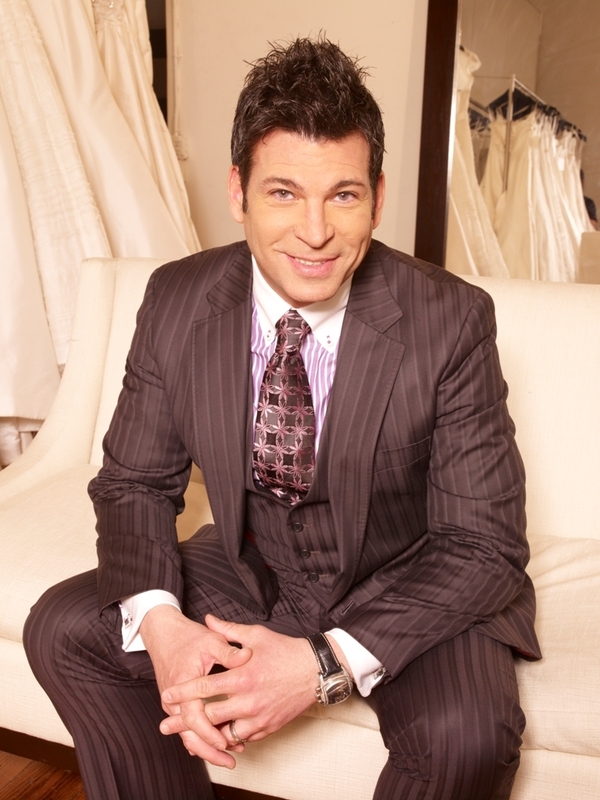 DT: Correct and at a significantly reduced cost than if they were to hire David Tutera anywhere else in the country. So what would have been a $400,000 wedding, Disney’s actually doing it for $75,000. LAM: Wow, who in the hell is doing that? I mean who is the bride? DT: It is a somebody, I mean I won’t say the name, but it’s somebody that has a privately owned business that has several chains throughout the country. When Disney approached me to do this, I was already sold into Disney because I’m a little bit of a fanatic of Disney. In fact, Disney was so happy because they were meeting several people for this potential role, and they had been following me for two years. LAM: It’s always nice to be pursued. DT: They had followed me to several speaking engagements throughout the country on weddings and finally one day I was in, there was this guy in the back row, clearly gay, clearly not getting married but consistently in all of my speaking appearances. So, finally I went up to him and I said, “I gotta ask you, why are you here again?” And, then that prompted him to say, “My boss wants to meet you”. So the Disney thing’s exciting, and the books are exciting with Disney. And I’m launching in September a two-hour prime time show to launch my QVC line. LAM: Tell me about the products. How different are they for fall than they are for spring? DT: The concepts are really great. They are products that are not really meant to entertain with. They’re meant to live your life with style but also double up as entertaining pieces. So whether it be phenomenal serving pieces that have multi-use serving pieces, table runners, placemats, artificial floral arrangements, and music. LAM: You had your stamp of approval and design everything? DT: Oh I’m-very much a stickler with that. LAM: So you know that it will be implemented correctly, I would think. LAM: Wow! How fun… what a great part of your journey. DT: Yes, I love it. I actually love it. I love the development process of projects. And I like to see them take off, and then I go on to the next thing. LAM: Right, so you have a team who executes your vision? DT: Yeah, I have a full time staff of a little over 60 people in New York. I launched back in July 2007 and I also launched a new project, which is called Stem. That is my first in the chain of beginning my retail experience. So we launched it in the Trump Taj Mahal in Atlantic City, and I am opening up Stem at The Plaza Hotel in New York City. LAM: What is your vision for that for the retail component? DT: The retail component is a floral environment: it’s a floral experience, and it’s a floral shop. And, it is a gift boutique, but it is designed differently depending on the demographics of where the retail space is. The Plaza location is very high end, and then it’s going to be opening up later on the Disney Properties. Then Las Vegas will be next. LAM: They’re going to have to rename Disneyland to Davidland. Would you mind? You wouldn’t mind would you? (Laughter) Old Walt upstairs might mind or he’s frozen-who knows where he is. When we create a brand or are in charge of a brand, I eat sleep and breathe my brand, and expect everyone around me to do the same. DT: It’s hard when you have those expectations because you know what? We are always disappointed. LAM: You know what, my theory to that David is by response of my team, is to just try harder. It’s so simple. Just do it. Just get up there and do it. DT: I was interviewing for a new personal assistant several months ago and this one girl came in and she seemed she had everything perfect for me: she paid attention to detail, her enthusiasm, she was young, and she started interviewing me, which I thought was a little odd. She asked ‘what is one of the faults in your employees which you find causes them to be let go?’ Great question. She caught me off guard, so I said, ‘I can do one hundred things in one day. And I really don’t understand why other people really can’t do more than one thing-let alone-100 things in one day.’ She responded, ‘Well, I can’t do one hundred things in one day but I can certainly try and do ten. And I thought that was kind of low for me.